What Do We Know About GMOs? Posted August 19, 2014 by Shopping ForHealth & filed under Consumer Research, News. Does the phrase “GMO” scare consumers? Does it affect their buying and eating habits? A quarter of primary grocery shoppers claim to have heard “a great deal” or “quite a lot” about GMOs. While that is significant, it is still on the lower end of other health concerns involving food, such as high fructose corn syrup, artificial sweeteners, trans fats and growth hormones in milk. Concerns about GMOs have been rising, from 15% of all adults in 2011, to 16% in 2012 and 20% in 2013. Only concern about high fructose corn syrup, which has also received media attention in recent years, is as high. Shoppers by and large (44%) do recognize that GMOs offer benefits, such as pest resistance in crops (25%), and extending shelf life (15%.) But 70% say they have “at least some concerns” about consuming GMO, primarily “the idea of creating something harmful and unhealthy with toxins or just messing with living organisms.” Twenty-nine percent worry that GMOs are not safe to eat and 25% think they may create additional food allergies. Seifer thinks this is an issue to watch. “Greater media coverage in the future could translate to even more awareness and concerns,” he said. 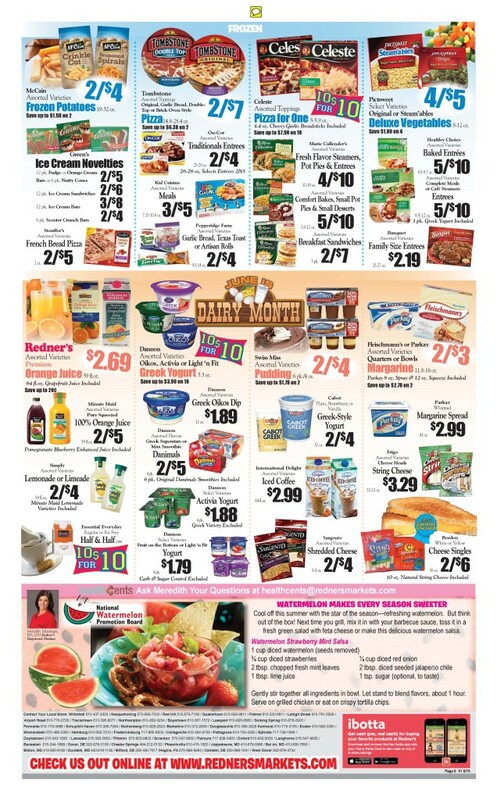 Posted August 12, 2014 by Shopping ForHealth & filed under News, Snacks. Many of us are thinking “back-to-school:” Shopping for school supplies, organizing clothes and, once again, getting used to packing those lunch boxes every day. For families and kids who could use some ideas to perk up that packed mid-day meal, think Mini Babybel®, the portion-controlled, nutrition-packed, red-wax-wrapped cheeses. Each serving of 100% natural cheese delivers 5-6 grams of protein, plus 15-20 percent of daily calcium needs – all for 80 calories or less. Mini Babybel® Gouda, paired with a Clementine or tangerine. Posted August 11, 2014 by Shopping ForHealth & filed under News, Shopping for Health Success Stories. At our 2014 conference this past April we had the unique privilege to partner with a number of healthy food brands, giving them face time with RDs from supermarkets all across the country. One of our guests was belVita Biscuits. We were able to learn about the healthy benefits of breakfast and even taste the product! One of our main goals at Shopping For Health is to create lasting relationships between RDs and healthy food brands. This is why we are so excited to talk about how belVita has helped Allyson, an RD from Homeland Supermarkets share healthy eating tips with her customers. After our conference, Allyson contacted her local news station, FOX 25 in Oklahoma to do a morning spot about healthy breakfast. Allyson talked about the importance of breakfast for overall health and promoted belVita as a healthy, “on-the-go” option for busy people. She gave her viewers several options for incorporating belVita biscuits into their every day routine including adding them to a parfait or eating them with peanut butter. We are so glad to see that partnerships from Shopping For Health are reaching consumers in a positive way. To learn more about belVita and to watch Allyson’s spot. Posted August 5, 2014 by Shopping ForHealth & filed under News, Recipes, Seasonal/Special Events, Vegetables / Fruits. Hot summer days are made cooler, tastier and healthier with peaches, a super fruit of summer. The orange-yellow color of peaches is a clue that they’re an excellent source of beta-carotene, an important antioxidant that’s converted to vitamin A. In fact, a medium peach has about 500 IU of vitamin, equal to about 10% of the Daily Value for this nutrient that is essential for optimal growth, bone health and vision. Supplies 15% of the Daily Value for vitamin C? Has 2 grams of fiber, or 8% of the Daily Value, and 1 gram of protein? Is 88% water, making it more filling for fewer calories? Is also a source of vitamin E, a potent cancer-fighting antioxidant? Peaches make a perfect snack, but are also great for pizza toppings (really! ), salads, salsas, soups and smoothies. Their sweet, mild flavor complements main dish meats like poultry, pork and seafood. Combine salsa ingredients in a medium bowl and refrigerate until ready to use. Prepare grill to medium-high heat. In a small bowl, combine cumin, sugar, and coriander. Brush fish with olive oil and sprinkle with spice mixture. Grill fish on oiled grill grates for 3-5 minutes per side until done. Char tortillas on grill about 10 seconds on each side. Serve tacos with avocado slices, fresh salsa and other desired toppings. 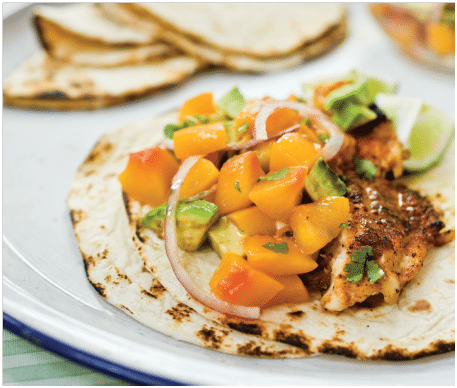 Sprinkle with lime wedges and serve topped with Peach Salsa. Is it Protein’s Time to Shine? Posted July 29, 2014 by Shopping ForHealth & filed under News, Protein. Seifer presented some interesting statistics reflecting American grocery shopping habits, noting that “healthy eating” is often defined now by what is added to the diet, not what is omitted. Whole grains, fiber, antioxidants and Omega-3 fatty acids are all noted by a majority of Americans as intentional positive additions to their diets. In addition, 54% of Americans say they are trying to add more protein to their daily meals. And 66% know that some proteins are more healthful than others. So how are Americans eating this protein? Interestingly, animal meat-based meals are on the decline: from 40.1% of meals that contained animal protein in 1984, to 35.75 that do so today. That means that non-meat sources of protein, such as eggs, tofu, beans and dairy products, are being consumed now, more with this specific nutrient in mind. Recipes Featuring Delicious and Healthful California Almonds! Posted July 22, 2014 by Shopping ForHealth & filed under Appetizers, News. At the Shopping for Health conference in Charleston, we saw first-hand the versatility of almonds. Sure, they are delicious munched on as is – but they can also do so much more. From appetizers to desserts, almonds add flavor, crunch and nutritional benefits. 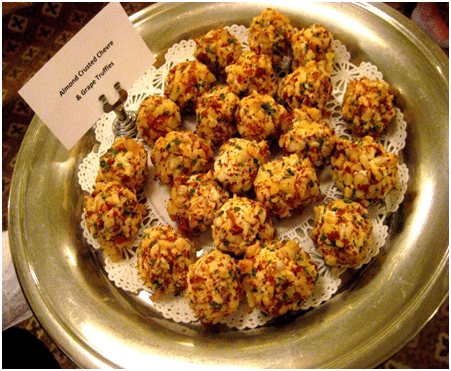 The Almond Board of California attended Shopping for Health and presented some new appetizer recipes. These are delicious and would be easy to duplicate at home. Combine black beans, garlic, tofu, almond butter, cumin, olive oil, lime juice and 1/2 teaspoon smoked paprika in a food processor and blend until smooth. Season with salt and pepper. Garnish with almonds and a dash of smoked paprika. Serve with fresh vegetables. Store bean dip in the refrigerator for up to 5 days, tightly covered. In a bowl, mix together chevre and cream cheese with a fork. Add port wine and a pinch of salt and pepper; mix until smooth. Chill 30 minutes. Toast almonds stovetop in a dry fry pan until toasted, shaking the pan frequently, about 5 minutes on medium high heat. Lay out on a large cutting board to cool. Using a chef’s knife, finely chop the almonds. Alternately, if you prefer to have ground almonds, chop in a food processor or grinder. Scoop 1 tablespoon cheese mixture. Press grape into mixture. Using plastic wrap, cover grape with cheese and roll into little ball with grape inside. Remove plastic wrap. Continue making remaining truffles. Spread almonds onto plate and mix in the chives. Roll each truffle ball in almonds and coat evenly. Refrigerate until ready to serve. It’s Sweet Georgia Peach Season! Posted July 15, 2014 by Shopping ForHealth & filed under News, Vegetables / Fruits. 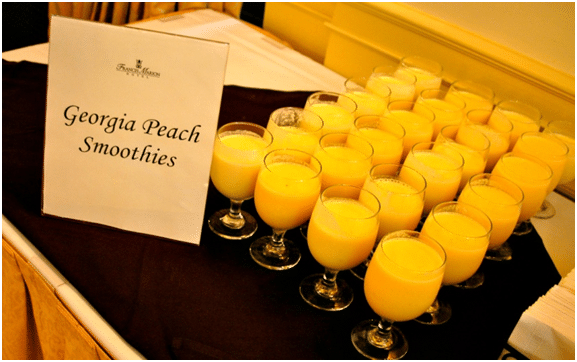 At the 2014 Shopping for Health conference, we heard about Georgia peaches and got excited about seeing them on store shelves. And now they are here! Look for peaches that are creamy gold in color. A red exterior does not indicate ripeness; the red color is an indication of the peach variety. (And there are over 700 kinds of peaches! The state of Georgia alone produces 40 different varieties.) If your peach is red, check the stem area for some lime green coloring to indicate ripeness. Avoid rock-hard peaches. The flesh should yield slightly to the touch at the crease of the peach. To ripen peaches at home, set them on the kitchen counter at room temperature. Do not put unripe peaches in the refrigerator. Once peaches reach desired ripeness, put them in the refrigerator. Enjoy within the next two to three days. In blender, combine peach slices with ice cubes and milk. Blend until mixture with slushy texture is formed. Blend in yogurt; combine for 30 seconds on low setting. Posted July 8, 2014 by Shopping ForHealth & filed under Shopping for Health Success Stories. At Shopping for Health, our goal is to assist registered dietitians, food commodity boards, companies and trade associations spread the message of healthy eating to grocery store shoppers. We provide grocery store RDs with sponsored content that is developed and reviewed by independent dietitians, to ensure accuracy and relevancy for use in grocery store use. We are always pleased to report when the Shopping for Health program is particularly successful in reaching consumers with important nutrition information. Our latest success story comes out of Redner’s Warehouse Markets, where their store dietitian provided store shoppers with important nutrition updates about watermelons, provided to Shopping for Health by the National Watermelon Promotion Board. How can this type of promotion work for your brand or product? Posted July 1, 2014 by Shopping ForHealth & filed under News. What could be better than eating watermelon on a hot summer day? How about a cold watermelon soup, all dressed up so that it’s fancy enough to serve at a special meal! 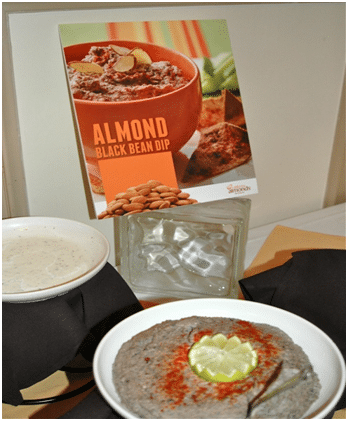 At the Shopping for Health 2014 conference, our grocery store dietitian guests were treated to this delicious soup, created for the National Watermelon Promotion Board by Chef Simon Andrews of Charleston’s Francis Marion Hotel. From first bite, we couldn’t wait until summer, when watermelons are at their best! Here is his recipe for Watermelon Cucumber Soup with Fresh Basil – easy to make and double in quantity, if needed. Serve it from a cooler for a casual summer picnic, or in pretty cups or bowls for a buffet or sit-down meal. In blender or food processor, puree watermelon and cucumber together until smooth. Strain to remove seeds. Return puree to blender or food processor; add orange juice, lime juice and honey. Blend until frothy. Refrigerate until cold. Pour soup into serving bowls or container. Before serving, top with small mix of diced watermelon, diced cucumber and basil. Beers From Coast to Coast! Posted June 24, 2014 by Shopping ForHealth & filed under Beverage, News. Take a walk down the beer aisle at your store; you may be surprised to see an array of beer labels coming from every region of the country! In addition to the major brands that you are most likely familiar with, your store may be featuring more and more varieties of craft beers. Craft beers are those produced by one of the smaller, independent breweries that are cropping up in literally every state. Although they currently represent only about 3 percent of all beer sales in the U.S., there is a lot of shopper interest in this category because of the range of styles and flavors offered.